Heat a couple of tablespoons EVOO, two turns of the pan, in a large soup pot or Dutch oven over medium-high heat. Lightly brown the sausage and crumble into small bits. Add the fennel, onion, garlic and chard or cabbage. Season with nutmeg, salt and pepper and throw in the cheese rind and bay leaf. Cover the pot and sweat the vegetables, 10 minutes, stirring occasionally. Add the white beans and stock plus 2 cups of water and bring to a boil. Stir in the fusilli; when just about cooked to al dente, stir in the peas and turn off the heat; let stand for 5 minutes. Adjust the salt and pepper, to taste. Stir in the parsley, basil and fennel fronds. Remove the cheese rind and serve in shallow bowls with an extra drizzle of EVOO on top and some shaved Parmigiano Reggiano cheese. In Recipes-list.com we have selected the most viewed recipes from category - uncategorized . Enjoy the best recipes specially selected for you! 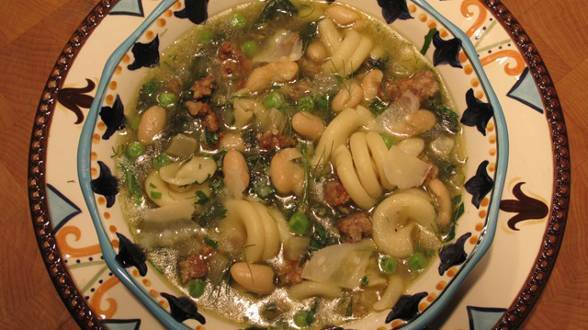 White Minestrone with Fennel and Sausage is the right choice that will satisfy all your claims.